I’ve had two recent demonstrations of the need for external validation by theists. One on Mike’s website, where a woman, Emily Rose Lewis in comments, insisted that only she was right with her fantasies about her god. When her claims were demonstrated to be false, and she was asked for evidence, the threats fell fast and heavy. I was told that I should be grateful that her god was so “merciful” because if she was in charge she’d “fry” everyone who didn’t worship her god exactly as she did. If you want to “fry” someone, it certainly seems that you hate that someone, and people don’t often hate for no reason. They hate someone or something because it has or could take something away from them, something that they are afraid of losing. In the second instance, there is much the same thing. Now, at this writing, this news story hasn’t been confirmed entirely. At a local school, in Carlisle, PA, a student was in the school nurse’s office when the morning pledge of allegiance was said. The student refused to participate in the pledge. The nurse’s reaction was (allegedly) “I don’t have to serve you.” (It seems that it was much worse, according to Hemant Mehta). A grown woman was threatened by the act of a girl, because she dared to not give the woman the external validation she needed. Now, could this woman be something else than a Christian? Perhaps, in another culture, but in Pennsylvania, that chance of her not being a Christian is no more than a snowball’s chance in hell (9th circle of hell, Dantean style, not included of course). External validation is one of those things that humans love. We often learn from external validation, when someone tells us we did something correctly, be it a skill or a behavior desired in society. 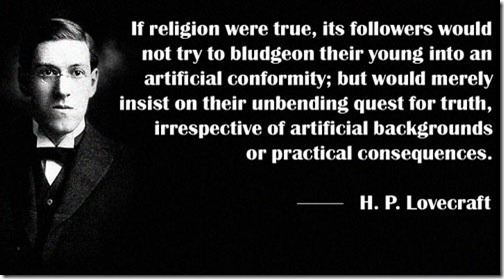 In most, if not all, religions, external validation is very important to a certain subset, those who want to believe that they are the only right ones and, somewhat paradoxically, believe that they should never be questioned about their claims. One would think that such surety would invite questions. This type of theist wants to be right and want no one else to know that they aren’t. They need constant agreement with them so they ceaselessly try to find those who will support their claims and who won’t question them. It often becomes very close to narcissism, especially when the theist is sure that God speaks to them and only them. If the believer doesn’t get the attention and admiration that they think they deserve, they get downright nasty. The few things that are decent about religion go right out the window. Their self-worth is entirely wrapped up in what they believe is true. If they present their claims to a stranger confident that no one can question them, and that stranger says “no” or worse “no, and here’s why”, then it is an attack on their entire being. They are no longer the worthy, special “chosen” that they thought they were. If someone doesn’t ape their actions, then that person is a threat. They find any action other than the one that they demand to be frightening. I think frightened is the best reason to explain why someone would act like so many theists do, be they Christian, Muslim, etc. In my opinion, some of the actions of theists, the violence and intolerance based on fear, is symptomatic of the loss of certainty that theists once had. Where at one time religious differences were settled by the stake and the rack, they are now open discussion. The respect and silence built out of fear and ignorance is failing. When someone says “I don’t have to serve you.” Or that “If it were up to me Id have fried have the world by now.”, it does a lovely job of showing how much they are afraid of anyone different than they are and how much that fear inspires violence. These people wish the law to only allow those people like them to exist, wishing that the protections of the law only applied to them and no one else. They wish to claim that the “other” isn’t in society, that they aren’t human. Welcome to Easter. Based spring fertility worship, changed to a worship of blood sacrifice and then resurrection, we have a holiday that has many faces. We’ve even had many dates for it, and the usual religious friction of who is “right”. Take this guinea pig and chicha in remembrance of me. 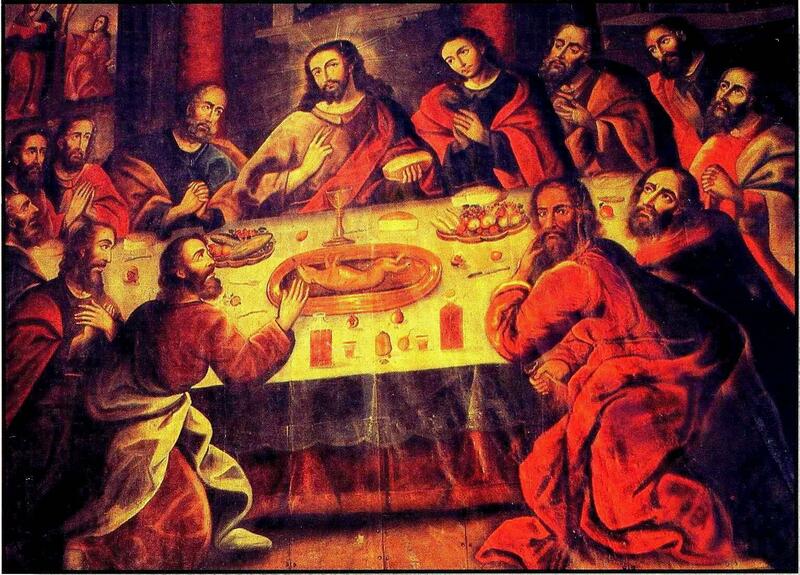 This is a painting by Marcos Zapata in 1753, where Jesus Christ and the apostles are enjoying Peruvian cuisine(more about the cathedral here). If there’s a picture, it must have happened right? This sure would have made my serving of communion a much more interesting experience. This is how spring should be celebrated, flowers and a nice bock style beer. Recently, I had a short blog post about a new book I’ve read, One Nation, Under Gods. I love the book, and thought I might write a longer post about it now. And I need to since I’m going to be lending it to my parents to read tomorrow. One Nation, Under God is a new book by Peter Manseau, a writer who has his doctorate in religion from Georgetown University. This is a book that is definitely needed considering that many Christians in the US are doing their best to rewrite history to fit their fantasy that the US was founded as a “Christian Nation”, though of course they don’t agree on what a “Christian Nation” actually would be. The book presents the facts very well and is not favorable to any particular side. The book’s strength is that it relates the changing religions in the US, and to a lesser degree, the whole of North America, to the politics and culture of the times. It starts us in 1492, bringing in the state of European religions to how it affected the urge to colonize the New World. From the likely hidden Jews on Columbus’ ships, forced into a masquerade by the murderous Roman Catholics in Spain, to the Muslim slaves of the conquistadors, and the native Americans, we have how religion mix, mesh and change, showing that no religion has some inviolate “truth”. Next is the immigration of the various northern sects of Christianity coming in from Europe, those who were sure that their versions of Christianity were the only “pure” ones. They, of course, promptly decided that anyone who disagreed with them once they crossed the Atlantic needed to be killed or to be banished from the colonies that they established. Their quest for a free place to worship was an entirely selfish desire that they would do anything to forbid anyone else access to. Their various “shining cities on the hill” were bastions of fear of the “other”. We do have the surprising story that Cotton Mather, famous from his sermons often included in Early American Literature classes, trying to encourage the use of a native African superstition which was essentially vaccination to stop smallpox, an awful disease that killed Mather’s family. Mather’s slave, renamed Onesimus after the slave that Paul returned to his master, told him of this practice. Mather did his best to encourage his society to do this but felt the sting of rejection for his new ideas because any attempt at relieving disease was considered going against the will of his god and his god’s divine judgment. We also had Jews migrating in this period since they were persecuted by most other contries that had some form of Christianity as the state religion. For example, Jews were forbidden in England for 300 years. In the book, it describes the plight of Jews that had to leave a South American colony that had changed hands between the Netherlands and Portugal. With Portugal came the Inquisition, so they begged passage to New Amsterdam aka New York City. They were nearly kept from there too, until the Jewish backers of the Dutch traders threatened to pull their backing.